This time it is getting more simple, but is it really?! Well… let’s find out! At a first glance there is not much to it, just a simple three hands manual wind watch, with a date… and a green eagle logo. 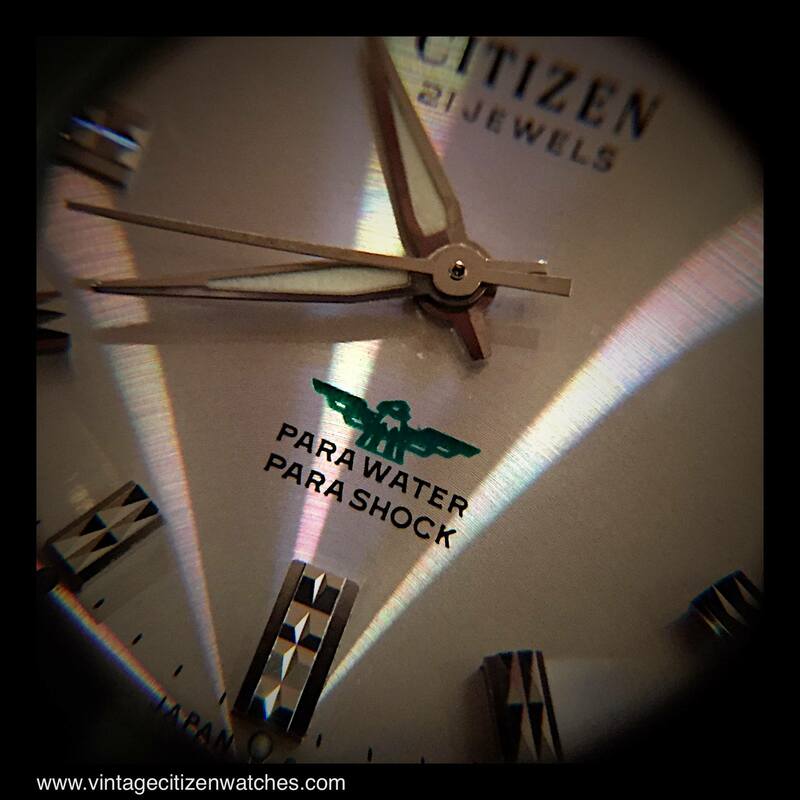 😉 This is the Citizen ParaWater, ParaShock, 63-1094. The watch is made entirely of stainless steel and has an acrylic crystal. The date magnifier is on the underside surface of the crystal. The winding crown in made of SS too and it is signed “CTZ”. So… the usual stuff. But then we take a look at the dial and we see the beautiful sunburst effect. And the striking feature is that the center of this effect is not in the center of the dial but at the 6 o’clock edge. It looks as a rising sun effect actually. Lovely detail! Then we see the raised applied multifaceted hour markers that reflect the light around, working perfectly with the dial. They are also marked with a luminous dot. The hands have also luminous material for better reading the time in the dark. Red and green. The dates are printed in red and the Eagle logo is green. Again, another visual detail that adds to the overall appeal of the watch. We will get to the green Eagle in a bit. The movement is nothing fancy, just a reliable hand wind one, with a date. It is the Citizen calibre 1802, with 21 Jewels. It doesn’t hack and it is not quick set date. In fact the date changes by going back and forward passed midnight with the hour hand. I was and I still am intrigued by the fact that the lume on Citizen watches doesn’t seem to age like the one on Omega or Rolex or other collectable brands. 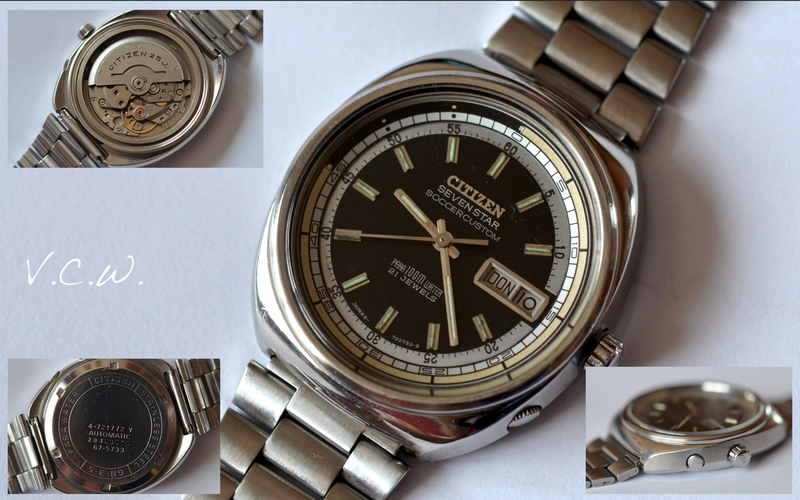 In fact I lusted for an aged, yellow-brown lume for some time now, on a vintage Citizen and was not able to find a good one. They are either perfect green like new, or, on not well preserved pieces, dirty. It made no sense to me. How can I get a nice patina dial? Finally my dream came true with this awesome timepiece! This watch was made in 1962 soon after the introduction of the first water resistant Japanese watch: the Parawater. It also has the Professional label, a rare clasp, a Jet movement and an awesome case back engraving. This was an age when watches had a practical use and not the jewelry that they (sometimes) are today. The case is made entirely in SS, it is about 37mm and has a simple dial, three hands and no date. The lug hols make changing the original SS bracelet changes so easy! In fact this is a watch that looks good no matter what strap you throw at it: nato, mesh, leather, even rubber. The winding crown is also SS and it is unsigned. At first sight it is very similar with the Parawater I told you about, but this one is not made for water use, but for aviation?. An indication of the link to the aviation is the Jet airplane engraving on the back and the Professional label on the dial. Also a Jet logo is printed on the dial too (Jet movement). In fact the dial has 12, 3, 6 and 9 printed, and the markings: “Citizen Jet, Para Water, Professional”. The hour markers are trapezoidal, raised and polished. They are filled with (now) the beautifully aged luminous material and so are the matching dauphine hands. All things considered it is a beautiful, simple, balanced face that I like a lot! I have seen very few examples of this model and some of them have an arrow shaped hour hand and a thicker minute one with a flat tip. The movement is the usual Jet movement with a circular swinging rotor. It runs at 18,000bph as all of them do. This one is the first one made, launched a few months earlier, in October 1961. My watch in made (3-4 months later) in March 1962. It is an automatic (hand winding also possible) with non hacking sweeping central seconds hand. It is called Citizen calibre 3010, Jet movement, and was the first movement that Citizen produced in relatively high numbers. The interesting fact about the rotor is that in earlier types it is marked “Automatic” rather than the usual “Autodater”. The date was added a year later, and so did the name “Autodater”. Could this be the first real diver made by Citizen? Well.. maybe it is this one, maybe it is the 120m (that for sure I will write about in the future – read about it HERE). Either way, it is one of the first and what a beautiful watch it is! The first thing I noticed about this is the “skin diver” engraving on the back, making it really special at 200m (para200mwater). It is the only diver Citizen made with 200m water resistance. The screw retained case back is not marked with a serial no, so unfortunately the date of manufacture is impossible to accurately determine. Because the watch is powered by the Citizen cal 1120 jet movement, and taking other aspects into consideration we can assume it was made somewhere around 1962-1965. The case is made entirely in stainless steel, having the top part brushed in a circular pattern while the rest is polished, with integrated lugs. The Tropic strap dimension is 19mm and is the perfect match for a skin diver. The frictional bidirectional bezel is a one piece design (no bezel insert) and painted black. Because of a lot of usage the edge becomes silver as the paint is slowly being worn away. After all it is a 50 years old tool watch that was used as Citizen intended it to be. On 12 it has a luminous dot, not the usual triangle. An interesting feature of the watch is the fact that the bezel is a count down type, starting from 60 and going down: 50, 40, 30, 20, 10, 0, not the other way around as usual. Each minute is marked with a dot. The dial is painted in a beautiful glossy black with integrated hour markers that are polished. Wonderful design of the markers and the hands. On 3 there is the date window, that has a polished frame too. 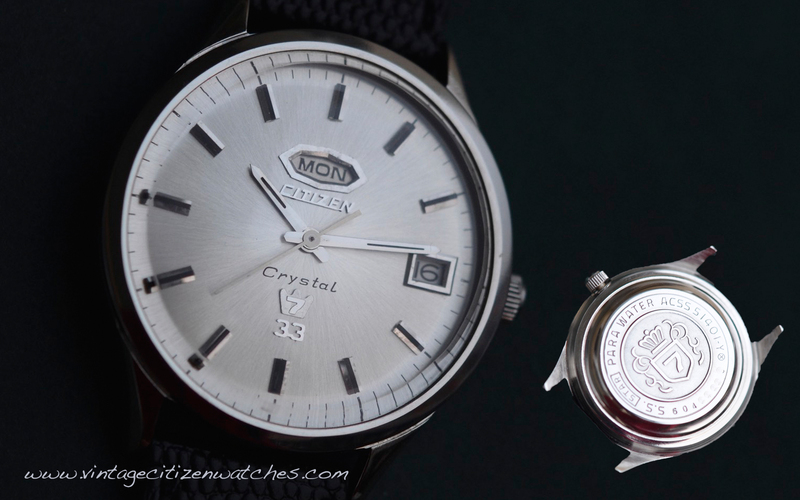 Citizen made the date reading better by providing an acrylic crystal with an outer date magnifier. The winding crown is not signed and operates the movement. It is not a screw in type. Although the Citizen jet movement 1120 ( 21 jewels ) is an automatic one it can be winded by hand too. This is done in the first position of the crown. In the second position the time can be set. The seconds do not hack and there is no quick set date. The date changes by advancing the hour hand past midnight. One very rare variation of the skin diver is the silver dial one with gold accents (bezel, hour markers and hands). By contrast this one has a “normal” bezel counting up not down as the black version. I have yet to find another, or a catalog picture, to be sure this is all 100% original. (Stephen provided another picture of a similar one but without a bezel so it seems it must be legit. Thank you! ) Update: Both variants are now a part of my collection. The silver dialed one is on original rubber bracelet with Citizen golden buckle. All things considered, black or silver, this is a beautiful, rare, awesome diver that has it’s own place in Citizen history, and ofcourse, in my collection. 🙂 Read more about other Citizen divers HERE. 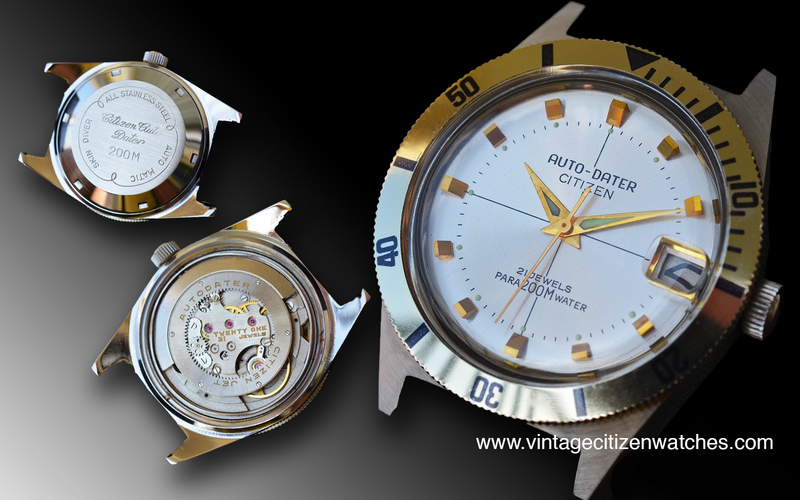 Read more about the first Citizen diver, the Jet Autodater 120m, HERE. This one is one of the very best Citizen has ever made. I was lucky enough to find a mint, NOS example. 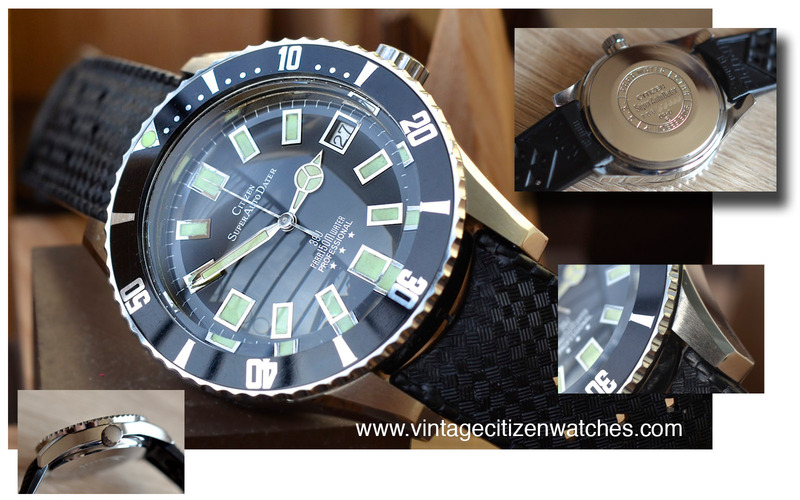 It has all the characteristics that a top quality iconic vintage diver should have. Even today after almost 50 years it stands out proud in the tough world of diving watches. It has a unibody case (the case back doesn’t come of and the movement can be taken out only by removing the crystal) made in SS, 40mm diameter, all polished except for the upper part of the beautifully shaped lugs. The fact that the case is monocoque is obvious when reading the engraving on the back where a small “X” inside a circle can be found. This is the sign that Citizen used for a unibody cases. The crystal is tightened in place by a steel pressure ring and there are two rubber seals that protect it from water intrusion. One ring in under the crystal and one on the side of the crystal. The crown too has it’s own rubber O ring making the watch water resistant up to 150m. Citizen used the term Para Water. (I love these words) So the watch is Para150mWater, making it the first of the iconic line of 150m divers Citizen made with the same overall look and function. 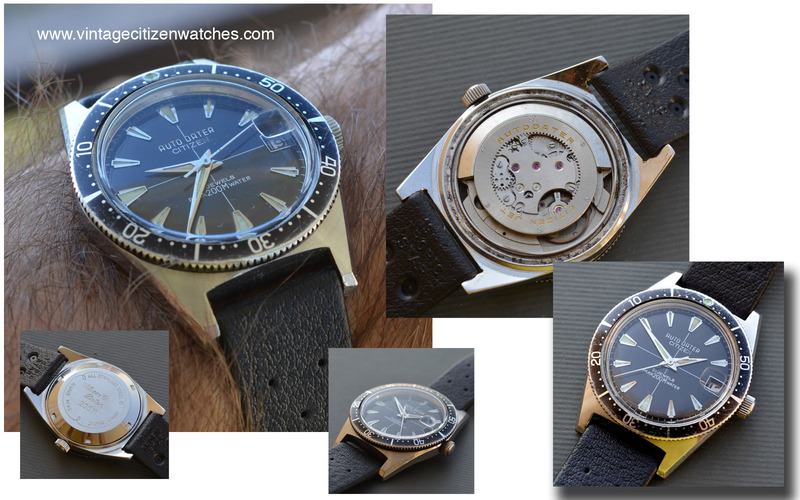 No Citizen lover should miss having at least one 150m vintage diver, no matter the model. Back to the crown (unsigned and polished), one interesting feature is the fact that the threads are not on the tube connected to the case but on the crown itself. So the crown indeed screws INTO the case and not ON the case like most of the screw-in crowns do. The bezel is bidirectional friction type with a simple insert with a luminous dot inside a triangle. The strap in this case is a Tropic curved ends one, 19mm wide at the lugs part that I think compliments the overall appearance of the watch a lot. It is a diver, Citizen used Tropic straps and this combination is gorgeous. Inside the watch the magic continues! The 1150 citizen calibre with 39 jewels is, if not one of the best, for sure one of the most beautiful movements Citizen has. The Super Jet movement was introduced in 1963, my watch is made in 1967, June. It beats at the usual 18,000 bph and it is automatic with hand winding feature also. It has a date that can be adjusted by passing the hour hand over midnight. It is not a hacking seconds. The beautiful part is the circular geared rotor. This is what Citizen called Jet movements. Some say that Citizen replaced this type by the centrally mounted oscillating weight because it was more economical to produce and service even though not as qualitative. 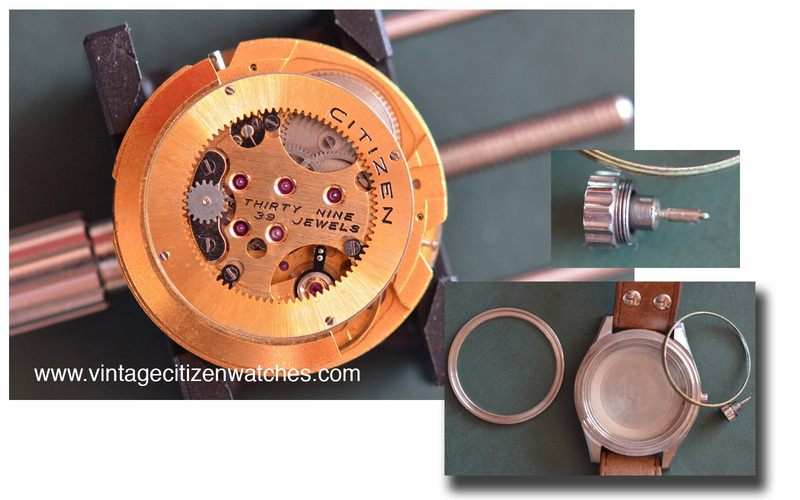 I would have expected to see a six screws rotor when opening the watch but I was equally pleased to find a rotor type that had four and is engraved “Citizen”only, without the usual “super jet”. The entire movement is gold plated. As a conclusion all I can say is that finding one of these is not an easy task but when completed the joy is huge and for sure this is a watch that once in your collection you will never ever sell. 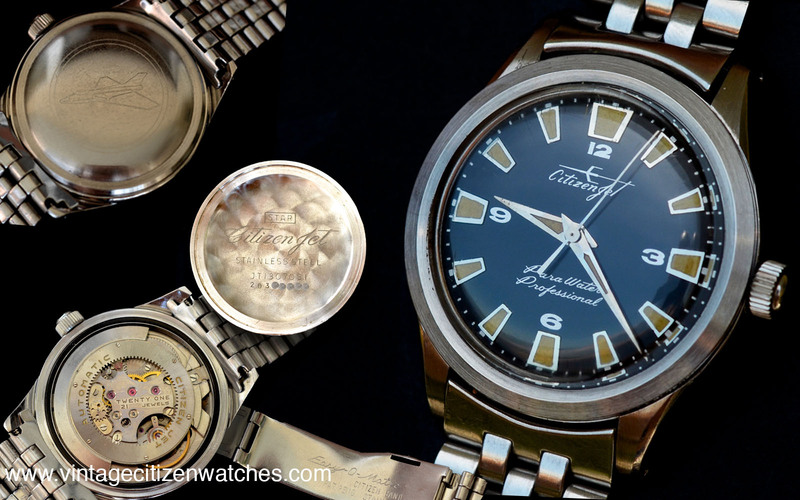 Read more about Citizen diving watches HERE. Among the interesting vintage Citizen, this one has it’s special place. It is the para water Crystal 7 with 33 jewels and a uni body case. The watch is the perfect size for a dress one, not too small, not too large just as it should be even by today standards, at 37mm diameter. The case is elegant, entirely polished, made in one piece of stainless steel. That means that the case back can not be removed and the movement comes out only by removing the mineral flat crystal. This is a nice feature that makes the case a little more water resistant by eliminating the risk of water entering the watch through the back. Because the case back is the same piece with the entire case it is possible to place the beautiful engraving in such amanner that it is always crown side up. This is a nice bonus to the overall look of the watch. The engraving shows the water resistance by “para water” marking and the uni case body is marked by a small “x” inside a small circle. The model is ACSS 51401-Y and was made in April 1966. The dial is silver, with a sun burst effect and a lot of applied markers. 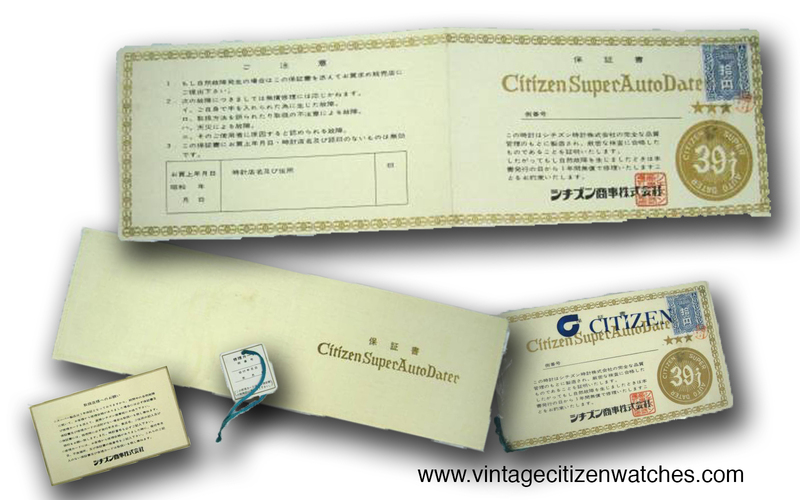 The hour markers are applied, the day and date frames are applied, the Citizen logo, the 7 logo and 33 marking are also applied. The “Crystal” writing is in black and so are the minute markers. The hour markers have a longitudinal black line just as the hour and minute hands. The overall look of the face is beautiful, silver with black, elegant accents. The only color used is the “SUN” in Sunday on the day wheel. 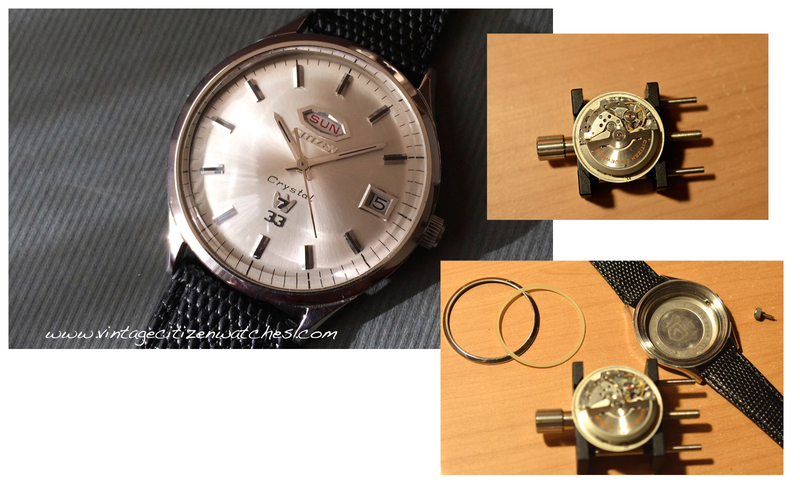 The movement is the automatic (hand winding is also possible) 33 jewels Citizen cal 5204 ? , beating at 18,000 bph. It is a quick set date while the day changes by advancing the hourhand past midnight. It proved to be very good at time keeping; some people even say it is very close to Chronometer grade and Citizen Chronomaster line. The strap is a replacement black leather Citizen strap with a simple stainless steel tang buckle. I think it fits the watch and adds to the overall elegant look. Beautiful, elegant, classy day-date vintage Citizen. 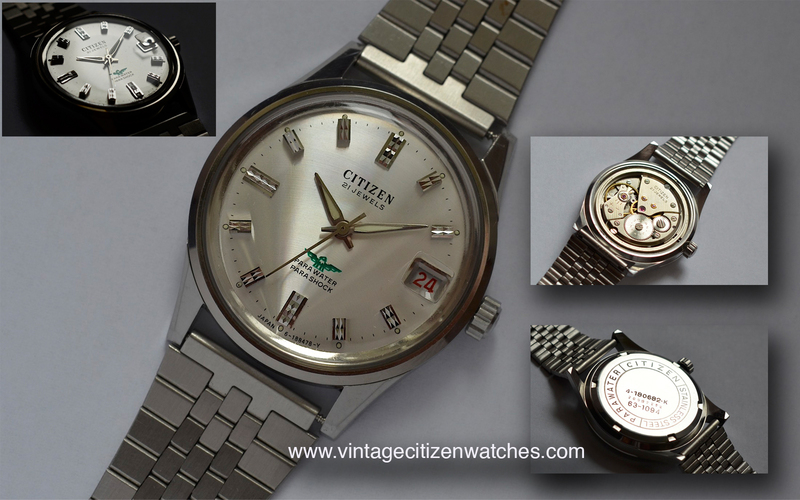 In their quest of diversifying their watch lines Citizen introduced in about 1970 a range of custom made watches. These were meant to target the sport area, specifically Rally, Soccer and Yachting. They were based on the Seven Star models and were modified so that they would fit into these three types. The Soccercustom is designed to be a useful tool in timing the 45 minutes soccer game. Just as the other models of the range, in order to do this the watch has an inner rotating bezel. The case of the watch is made in stainless steel, polished with brushed sides. It is cushion shaped and is 4o mm wide. The mineral crystal is large, with a flat surface. There are two crowns, a lager one at 3 o’clock for winding the watch and adjusting the time and a smaller one (integrated in the case) at 4 that rotates the inner bezel. Both of them are signed “CTZ”. The dial is black, with an outer silver ring that has the minutes scale. The rotating bezel in marked from 0 to 45 minutes. On 3 o clock there is the day-date window. It is marked Para100mwater 21 jewels asa well as the Citizen (producer), Seven star (line) Soccercustom (model). The movement is the automatic (also hand winds) Citizen calibre 5270, 21 jewels, non hacking. The Rally Custom and the Yacht Custom are powered by 25 jewel movements, 5290. The automatic movement runs at 18,000 beats per hour. The date can be changed by the operating crown but the day changes only by passing the midnight with the hour hand. The bracelet is simple, folded links, made is stainless steel too, with the usual signed Citizen clasp. Conclusion: A nice professional watch, along with the Rallycustom and the Yachtcusom, a rare piece that has its place in any vintage Citizen collection.